Chicken Divan is one of those things I never had until I was an adult. My father did not like casseroles (or chicken), so we never had them. This was a busy week, not much time or energy for cooking, so I was asking myself what I could make for dinner that wouldn't take much of either. Chicken Divan Casserole popped into my head because the first time I ever had it was at the home of a friend who said she never spent more than 15 minutes making a meal because that's how long her family took to eat it! 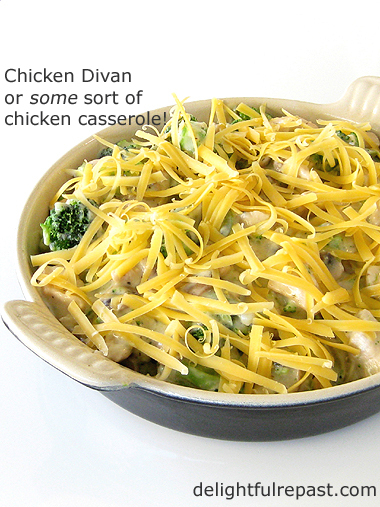 Mr Delightful likes casseroles, so I thought this might be a good time for Chicken Divan Casserole. Of course, I couldn't bring myself to use canned cream-of-something soup, so it might have taken a bit longer than 15 minutes. I wanted to use up the last of the plain Greek yogurt I'd bought for the Meyer Lemon Frozen Yogurt last week, so in it went as well to give the sauce a bit of tang. Sour cream would also work. I don't even know if this is chicken divan exactly. I used what I had on hand. Would've liked red bell pepper instead of green for added color, but when I bought produce this week I found that the red ones were imported and the green ones were domestic. I always buy domestic produce, local whenever possible, so green it was. How do you feel about casseroles? I think my dad was really missing out! 1 Preheat oven to 350F/180C/Gas4. Spray a 1.5- to 2-quart casserole with cooking spray. 2 In large skillet (I use the All-Clad 12-inch fry pan), heat 1 tablespoon of olive oil over medium heat. Cook the onion until softened, about 5 minutes. Then add butter, mushrooms and 1/4 teaspoon each salt and pepper; cook about 5 minutes. Add bell pepper; cook for a minute or two. 3 Push vegetables to edge of pan, add 2 tablespoons olive oil to center of pan. When oil is hot, add cubed chicken to center of pan; sprinkle with 1/4 teaspoon each salt and pepper. Cook until chicken is done. Sprinkle with marjoram, thyme and flour. Cook and stir for about a minute. Stir in milk and sherry; bring to a simmer and cook, stirring constantly, until thickened and bubbly, about 3 minutes. Taste and decide if you'd like to add another 1/4 teaspoon each salt and pepper. 4 Stir in frozen broccoli (no need to cook or even thaw) and yogurt until well combined. Pour into prepared casserole dish. Sprinkle top with shredded cheese. Bake for 30 minutes. Have a beautiful autumn day. Hugs! Thanks, Stephanie. Funny, I was just thinking about you and your sweet mom as I sat here blogging and sipping my tea! Sure looks like a great meal, Jean. We do like casseroles at our house and I make them a lot to have leftovers. We don't mind them either. I like your comment about imported vegetables. We are seeing more and more of them and I always wonder why we get veggies from Europe! How can that be economically feasible? 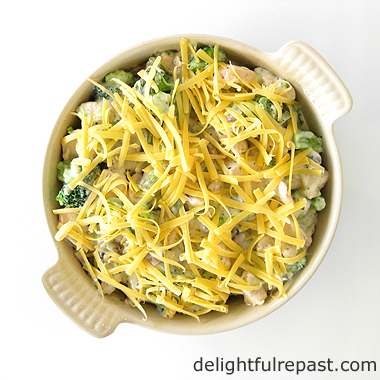 I have never had a chicken Divan...it surely looks very satisfying, comforting and tasty. Thanks, Martha Ellen! Yes, it's crazy about the imported produce. Cucumbers from Holland, broccoli from Ecuador, apples from Argentina, tomatoes from Mexico ... . No thanks! Angie, thank you. I think it was invented in a hotel kitchen in New York about a hundred years ago, so maybe it's not seen outside the US. Funny, my wife asked me yesterday why we don't have more casseroles! I usually make my hamburger casserole which she teasingly calls hamburger helper. "But it's got zucchini, mushrooms, onions, and eggplant in it too." I say. Anyway, thanks for another casserole recipe I can add to the collection. And, she can call it Chicken Divan all she wants. Richard, thanks. I do hope you'll both like it. You can add more mushrooms if you like. A casserole can't have too many mushrooms to suit me! Thanks, Debbie. I'm thinking it might have to go into my regular rotation. A divan (Turkish divan, originally from Persian devan) is a piece of couch-like sitting furniture or, in the UK, a box-spring based bed. Oh Jean, "Would've liked red bell pepper instead of green for added color, but when I bought produce this week I found that the red ones were imported and the green ones were domestic. I always buy domestic produce, local whenever possible, so green it was." Half of the plants, vegetables, shrubs and trees we have in the British landscape have been discovered by explorers in India, Thailand, Madagascar, Australia, South Africa and many other far flung parts of the world. Britain had an Empire that joined everybody together. If we don't trade things, swap cultural ideas and create synergies in all sorts of differnet things, music and art also come to mind, we stop developing as nations, states and people. We need people and all sorts of things from around the world. We should not let the narrow stifling, nationalist ideas of people wanting Brexit in this country and the Donald Trumps of your world choking us all to death and cutting off what makes the world rich and diverse.I am disappointed Jean. Tony, you misunderstand my statement. My preference for local produce has nothing whatever to do with nationalism or wanting to be cut off from the rest of the world. My preference for local produce stems from wanting to support local farmers, get the freshest possible produce and do the least harm to the planet. If I have a choice between an apple from 60 miles away in the next county and one from 6,000 miles away in South America, I'm going to choose the apple from 60 miles away. It will get to me fresher, I'll be supporting a local farmer and I'll be contributing to cleaner air and less waste of fossil fuels. Nothing disappointing in that. Any excuse to bring in politics!! Ha! Ha! Using local fruits and vegetables is the best way, maybe the only way, to get fresh produce.Yes, you are right about reducing the carbon footprint.You are right Jean. Everything we do is a political act though, don't you think Jean. So much is uncertain at the moment. The old prejudices are on the way out and new prejudices are on the way in.What sort of world will we both live in this time next year? Hi, Jean! I can call it anything and hubby will love it but I CAN'T call it a casserole because he'll say, "I don't like casseroles." I like to see my meat and then my vegetables. I don't argue about a name. After all, a rose by any other name. . . So I just make up another name, and I do not stick in casserole. One pan or one pot is okay. Your recipe sounds delicious, and I agree a red pepper would have been a great addition. I will say I don't purchase canned cream soups anymore. I found that taking the extra minutes to make a homemade creamy sauce is so much better. Great recipe!! Wow, Jean - this really takes me back. My mother used to make chicken divan in the late 60s and early 70s! As a kid, I loved this dish and so did all my brothers. I know I haven't had it since Mom died in '88 - so I will need to give it a whilrl. And, I have to say, yours sounds a lot more interesting with the added herbs and - especially - the red bell pepper! Thanks so much, David! I do love things that remind people of their mothers or grandmothers. In many cases, though, I'm replacing ingredients with something better, such as butter instead of shortening or margarine! I think I may have to make this over the weekend. Rain. Gloomy. Temps dropping... a chicken casserole sounds like the perfect comfort food. Sounds like my kind of weekend! If you make it, do let me know how it turned out for you. And enjoy that wonderful rain! I definitely need to try this! It looks like the perfect comfort food recipe for fall! Thank you, Michelle! That's just what I was aiming for! This is almost exactly how I make my chicken casserole, right down to the yogurt instead of the Lake Woebegone Lutheran Church women's version with cream-of-something soup. Lol (no offense intended, my Lutheran friends). I like an occasional casserole, but only if there are enough people to help me eat it. It's one of those dangerous foods that don't have a defined border. Anyway, I wish I could give you some of my (large, sweet, red, Italian) Carmen peppers, Jean. I'm getting a ton of them this year! One of my plants has 18 peppers on it! I love how the broccoli peeks through the noodles. Judy, yes, we don't want to offend! LOL Wish I could trot right over and take some of those red peppers off your hands! Thank you, Christine! I'd have liked to have some strips of red pepper peeking through the cheese, too. 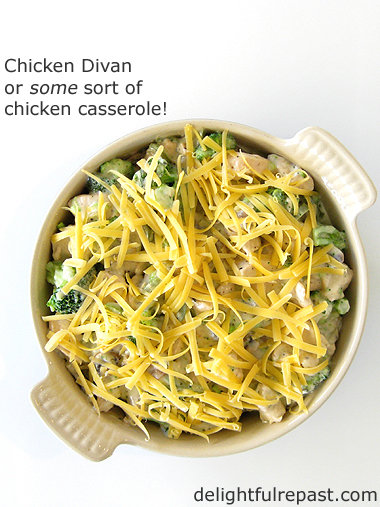 I love casseroles, Jean, and Chicken Divan is one that I haven't made in quite awhile. Your version sounds perfectly wonderful! Also, your Meyer Lemon Yogurt would be a delightful ending to the meal. Yes, I love frozen yogurt! Kitty, thanks so much! And I hope you have a wonderful weekend as well. Looks like a delicious dinner, I've not come across it before. Thanks for sharing, Jean. Jean, your casserole rocks! I made it Friday -- with some modifications for time. It was great. Here's what I did differently. To save time, used shredded chicken from a rotisserie chicken. Probably saved about 15/20 minutes for chicken to cook. Maybe more, who knows. Cost was the same as buying the chicken breasts (this week, who knows about next!). No sherry in the house so I used white wine. It was fine. As you suggested, I used the red pepper, julienned. Very nice. In addition to the marjoram and thyme, I had fresh parsley and some dried tarragon and added that to the mix. I served it with egg noodles and roasted squash on the side. It was a hit and enough for two of us to enjoy leftovers tonight. And also, thanks for stopping by the Gypsy and your wonderful comments. I wish there were conservation laws that would have helped save the trees but their property, their trees. There are some restrictions related to the lake. However, fertilizer on lawns, much to my chagrin, is not one of them -- probably why there are always more weeds in the lake. It's discouraged by apparently that doesn't pertain to people with big houses and lawns... very sad. Thanks for such kind support. This looks like a fantastic casserole, we will love it! Hope you are having a great day and thanks so much for sharing with Full Plate Thursday. Amalia, thank you! Sorry I'm late replying and visiting commenters, but I've been without my computer for a few days and trying to make-do with a substitute, and I've been technically challenged! Thanks, baili. I hope you'll get a chance to try it soon! Jeanie, I'm so glad you made it! AND that you shared your substitutions with me. I do like to use what we have on hand! About the fertilizer on lawns by the lake (that then runs into the lake) -- Yikes! What are people thinking?! Marilyn, thanks so much. I love sharing my recipes with your readers. Miz Helen, I am always too happy for the opportunity to share my recipes with your readers on Thursdays. One word for your recipe: Yum! Thanks for bringing your recipe to the Blogger's Pit Stop last week. Thanks, Janice! AND thanks to you and the Crew for doing a great job!